Ay caramba, I've fallen behind again! It looks like my education is getting in the way of your weekly arepafunk. To make it up, I've used some of the good stuff I've been "saving" to impress you. This week we have George Guzman opening it up with Diggin' Rice N' Beans. With all the food related lyrics in both ingles and spanish, I thought it was perfect to kick things off. Yo vengo soltando chispas, yo vengo hechando candela... I love the catchy lyrics on Pete Rodriguez's track Soltando Chispas. Great dance tune. 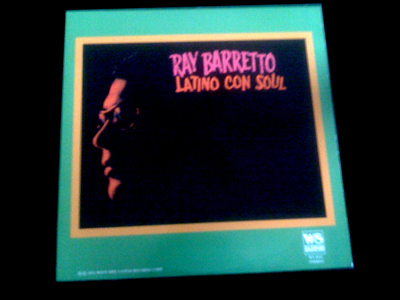 After Joe Bataan's Muchacho Ordinario, you'll hear three boogaloo grooves by Ray Barretto, Larry Harlow, and Joe Panama. Great stuff! Nat King Cole's Ay, Cosita Linda is a classic. If your looking for a new album to pick up, be sure to check out the Nat King Cole tribute album Re: Generations that came out earlier this year. Here's the link to the iTunes store. A couple of weeks back I know some of you were really diggin' El Pito by Joe Cuba, so I included Bang! Bang! which has that same fun energy. Next up is Willie Colon's The Hustler, the title track from his 1968 album. Look forward to some great solos. And last but not least is a live song by the Fania All Stars at Yankee Stadium. Congo Bongo features Mongo Santamaria and Ray Barretto on the congas with Hector Lavoe and Cheo Feliciano on vocals. I only wish I coulda been there to see this!!! Bueno, its back to studying for my final. hey john, good luck on your final... just wanted to send out some appreciation.. I'm listening to this week's right now in my headphones at work. Diana & I listen every week.